This week is an ode to Bill Waterson, writer of Calvin and Hobbes. The one thing that comic strip did better than any other, in my opinion, was to capture the imagination of a young boy in a unique way. Not only was Hobbes a terrific character, he was so because Calvin imagined him that way. Bill Waterman managed to recreate childhood in a way that readers – both adults and children – could relate with. Another thing he managed to do was to develop another character who is a hero to modern man. A character who recreates childhood from the eyes of an adult in a way we can use to influence our lives for the better. That character is none-other than Calvin’s dad. Calvin’s dad represents the child in grown ups. He represents a cycle of not taking life too seriously despite the responsibilities we have. There’s no responsibility greater than raising a child and you have to think twice about a guy whose kid has such an epic stuffed animal. Calvin’s dad never really gave up his inner kid, he just learned how to leverage it along with everything else he picked up about life. He has managed to weave his childhood into his grown up life as a way to both handle responsibility and to keep himself young. Anyone who is a dad knows that there’s no book you get. At least nobody gave me mine. I do think there’s some wisdom involved here on the part of Waterman and Calvin’s dad. Keeping yourself young is good mentally. It also helps us relate to our kids. Hardly anything Calvin’s dad said was really that believable. What he did do was try to explain the world around them in interesting ways. Of course, most of these ways were pretty fanciful but they were always entertaining. Everything was somewhat grounded in reality but he often got more and more off track. Many of these explanations even started off track. Children are naturally inquisitive and can ask nonstop questions that challenge our knowledge. They also look up to us to help make sense of things. Adding some clever humor to the mix keeps them on their toes and keeps them questioning. When I explain things to my children, they’re on their toes for something like what you see above. When I give them a real answer to a strange question, they can take it with raised eyebrows. A Calvin’s dad says, “You can’t believe everything you read.” That’s a real lesson. 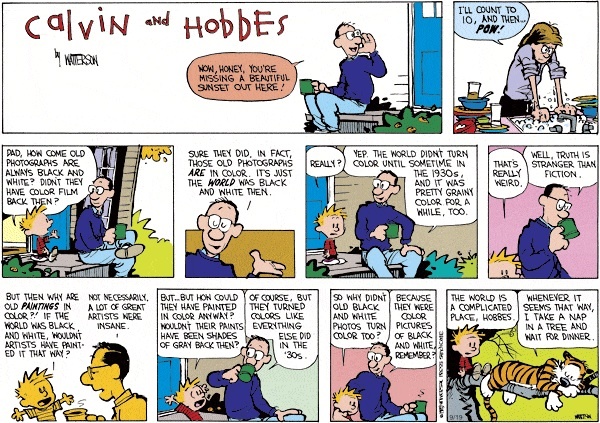 You’ll also notice that Calvin keeps questioning his dad and doesn’t take all of his explanations at face value. 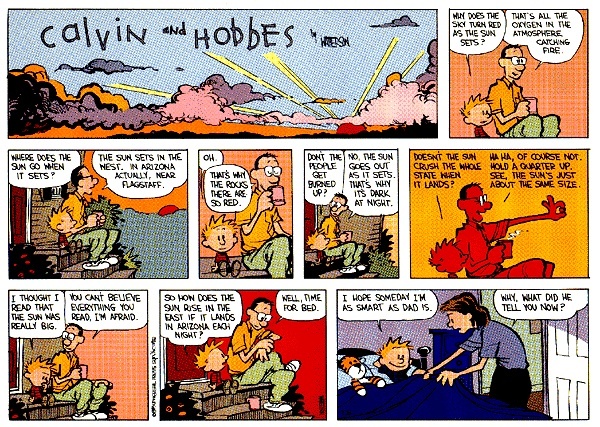 I have to believe that Calvin grew up to keep that sense of childhood inside him and passed it along to his own kids. Truth is stranger than fiction but fiction can be pretty fun. For thoughts from my dad, read The Wisdom of Rocky. OK, they’re thoughts my dad passed along from a boxer in a movie. I don’t know if that’s better or worse than what I pass on to my own kids. Dewd! You didn’t get the book on fathering? My kids also know to take my answers with a grain of salt—they have had practice in BS detection, but they still come to me with questions. I agree that some of ‘childish’ characteristics are good for fathering: the sense of adventure, being open to new things, questioning, not being too serious, a sense of wonder at the world. A sense of wonder is actually something that I think children give back to their parents. These ‘childish’ characteristics must be balanced with ‘adult’ characteristics such as discipline, focus and thinking long-term. Sometimes you have to be a parent, not a friend, and set limits or push your child. One challenge I’ve been dealing with lately is backing away and letting go of control for my boys who are now both in high school. Great points, TB. Right now, both kids are in huggy-love-dad mode which is fabulous. There are times I coach, times I lecture and they know they’ve messed up, and times I go bananas. I try to minimize the bananas part but it happens.